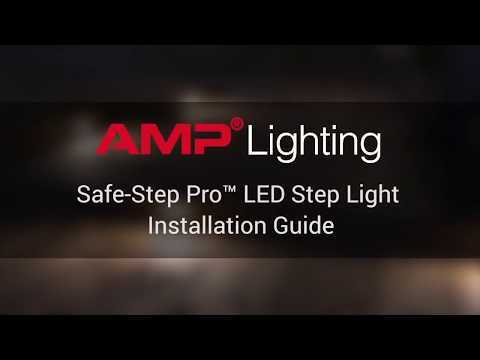 The AMP® Safe-Step Pro™ LED Step Light is a cast brass fixture that mounts onto the surface of stair risers. Heavy-duty brass fixtures provide the high level of performance and durability essential for lighting professionals. With solid cast brass construction and an integrated Cree® LED light source, this professional fixture performs a critical safety function – lighting steps and stairs (features that must be illuminated to prevent trips and falls). The AMP® Safe-Step Pro™ LED Step Light performs this function perfectly. Its louvered design and low profile makes it ideal for surface mounting on stair risers or sidings. Even when mounted just inches above the floor, its light distribution is wide enough and extends forward enough to fully illuminate typical stair treads. The louvers also ensure the complete absence of uplight, entirely preventing direct glare into the eyes of people ascending the stairs. No other light fixture presents such an effective solution to the safety risks associated with steps and stairs in the landscape.